The annual TICL Conference will be held June 11 & 12, 2018. The keynote speaker, Eric Curts, will motivate you to refresh your teaching techniques and enrich your students’ learning using the latest technologies. This para educator course is the first in a series of three that will allow a person to become a certified classroom para-educator. The participant will need this course as a prerequisite to enroll in Para-Educator Course II. Participants will develop skills and strategies to enhance communication and examine situations where professionalism, ethical standards, and confidentiality will guide the correct course of action when working with colleagues, students, parents, and others. The course will look at stages of development, core curriculum, beliefs, biases and will have an online computer component. 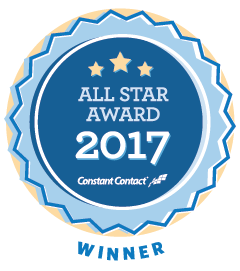 Great Prairie AEA has been named a 2017 All Star Award winner by Constant Contact, an Endurance International Group company and a leader in email marketing solutions. The annual award recognizes the most successful 10 percent of Constant Contact’s customer base, based on their significant achievements using email marketing to engage their customer base and drive results for their organization during the prior year. GPAEA uses Constant Contact to connect teachers, administrators, community leaders, and staff with educational news and updates via The Cornerstone, a monthly e-newsletter. Join the list at https://www.facebook.com/gpaea/app/141428856257/. Enjoy this issue of The Cornerstone by clicking on an article below or scroll down to get started! Congratulations to the 39 schools in Great Prairie AEA being honored for their PBIS implementation efforts for the 2016-17 school year (107 across the State)! To qualify for one of the six levels of recognition, schools were provided the opportunity to complete an application and submit evidence from May 15, 2017, through December 31, 2017. As part of the review process, PBIS Coordinators approve the award level based upon submitted products, student outcome data, and implementation fidelity data. The criteria for each level aligns with a stage of implementation, with criteria building from the planning stage of Emerging level through full implementation and sustaining, or the Paramount level. Schools will receive banners and a letter of recognition in the van mail later this month. Congratulations – GPAEA is proud of you! Photos of Districts who have received their banner. Please send all photos to shelli.blazic@gpaea.org to be featured. The Building Bridges: Assistive Technology Conference will provide an opportunity to see first hand the latest in assistive technologies (AT), practices, and services for school-age students with disabilities. This AT conference will serve as a unique opportunity for area professionals, parents, administrators and service providers to exchange and gather information on the current status and consideration of assistive technology tools. You are cordially invited to attend The Domino Effect Program on Wednesday, April 18, 2018. This program is brought to you via a partnership between the Iowa State Penitentiary for Men in Fort Madison, IA and Drake University. This NEW powerful program is designed to provide insight to those who serve at-risk populations. Participants will explore risk factors and statistics around at-risk youth. Furthermore, participants will have the opportunity to hear first-hand from incarcerated men who can testify to successful and unsuccessful interventions adults attempted while they were in school. Participants will also identify data related to their own school or organization around college readiness and post-graduate success. There is a non-refundable $35 fee to register for this course. The deadline to register is April 9. Offered by a partnership with Drake University. A substitute authorization allows an individual who holds a baccalaureate degree from a regionally accredited institution to substitute in an elementary, middle school, junior high school, or high school (grades PK -12) for no more than five consecutive days in one job assignment. An individual who holds a Para educator certificate and completes the substitute authorization program is authorized to substitute only in the special education classroom in which the individual Para educator is employed. The course is designed to enable participants to become competent in the skills necessary to successfully substitute in Iowa’s secondary classrooms. These skills include classroom management, strategies for learning, diversity, and ethics. 14.143(3) The substitute authorization must be renewed every 5 years. Renewal requirements for the substitute authorization consist of a minimum of two renewal units equivalent to 30 clock hours and completion of an approved child and dependent adult abuse training program approved by the state abuse education review panel. Please refer to the requirements for Substitute Authorization from Iowa Code: 282_14.143(1)-(3) for the complete explanation of the requirements for substitute authorization. Payment of $130.00 is due 1 week prior to course start date. And must be sent to: Shannon Johnson at 3601 West Avenue, Burlington IA 52601. Background check fee of $75.00 and a $85 licensure fee (good for 5 years) is due when you have completed and is to be sent with application to the BOEE. $25 fee for Mandatory Reporter training certificate. March 12-16 the Media Center is on Spring Break! There will be no van delivery that week.